The UK Post Office issues a stamp set each year, in parallel with other European countries, to commemorate the European Postal Union. In 1991, a special hand franking was used for items posted at Kettering on the first day of issue. The actual stamps are not relevant to the story but if of interest, a description of the set can be found here. There were four stamps, issued as two conjoined pairs. The UK Post Office offered the opportunity for individuals or organisations to sponsor specially-designed handstamps to cancel the postage on the first day of issue. Fourteen special ones were created in addition to the standard design that showed just the name of the postal sorting office, the date and the words "First Day of Issue". It's good to see the British Interplanetary Society among them together with the Royal Aeronautical Society (where the Kettering Group accepted the Prince of Wales Trophy in 1984) but the presence of a VC-10 aircraft and crop circles is curious. The Kettering Boys School version was sponsored by a stamp dealer from Stoke-on-Trent in the UK. Its design mimics the Group's logo of a satellite in an elliptical orbit around a Northamptonshire Rose where the rose is replaced by a representation of a globe. This suggests that, if Geoff Perry had been aware of the intention to produce the postmark, he did not choose to associate the Group with it directly. With the similarity between the two designs, it begs the question of whether there was an earlier, draft, version that included the rose. The central area of the published version looks a little empty. For UK stamp issues, the commonest covers (envelopes) are from the Post Office itself and a long-standing company by the name of Stuart (now Cotswold & Stuart). Examples of the 'Kettering' hand franking can be found on both of their covers for the issue. This one was designed and issued by the same dealer that sponsored the handstamp. It depicts a map of the UK showing Kettering, and a representation of the Kettering Boys School (KBS) Badge. On the map, Kettering and its badge are joined by 'radio transmission beams' to each of the postal cancellation marks. There was a run of 500 printed and they were numbered. At the time, the dealer was offering them for sale at the price of 4.95 GBP but there is no indication whether they all found their way into circulation. The example here is marked "497 of 500". The dealer's name is not one that jogs the memory of any Kettering Group members. Enquiries to collectors of space-related stamps also produced a negative result. In all probability it is a philatelic dealer who decided to cash-in on the Kettering connection to space. 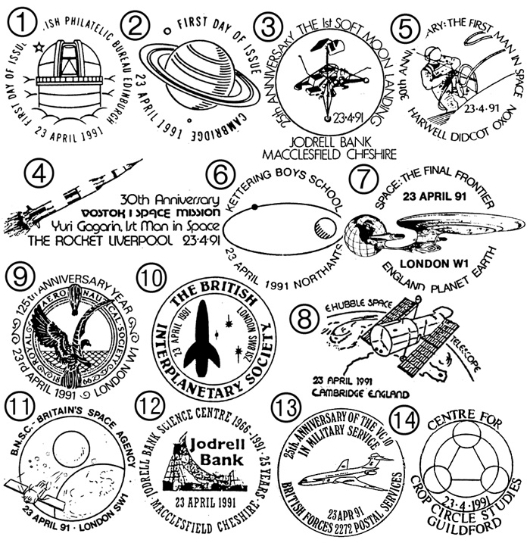 Although the stamp issue is entitled "Britain In Space", its design is astronomy-themed. The Post Office obviously did a good pre-issue selling job on the basis of a slightly misleading title because the largest proportion of handstamp designs relates to satellites and spacecraft.